Master P and his son, Lil Romeo, dedicate much of their time and energy towards helping others, specifically young people and those affected by disasters such as Hurricane Katrina. Master P founded Take A Stand Records, a record label which will not release music with offensive lyrics. The proceeds from Take A Stand Records go to scholarships for underprivileged youth. 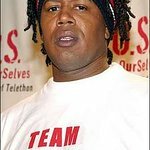 Master P is an NAACP Youth Ambassador. Google trends for "Master P"
We don't have any videos related to Master P.